++ FREE!! TOM’S INSTA-PICK Premier Ultimate Software Program!! NOW ON SALE….. Regularly $177, but NOW just $118 for a limited time only! And just wait to see how much $177….I mean, just $118… will buy you!!! ANDDDD — I will send you my stand-alone, complete Insta-Pick Premier Ultimate Software, a $138 value, FREEEE!!! 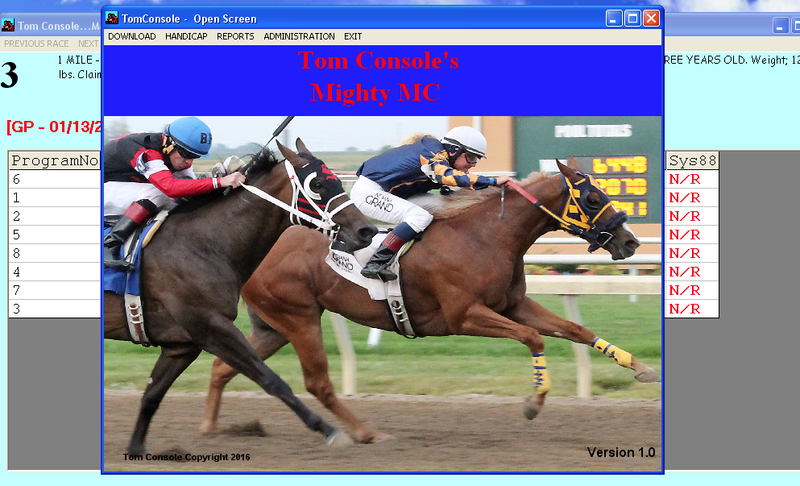 Tom Console here with my latest offering to the thoroughbred horse racing handicapping community. It is called “The Mighty MC”. First, let me give you a little insight as to where the “MC” name comes from. 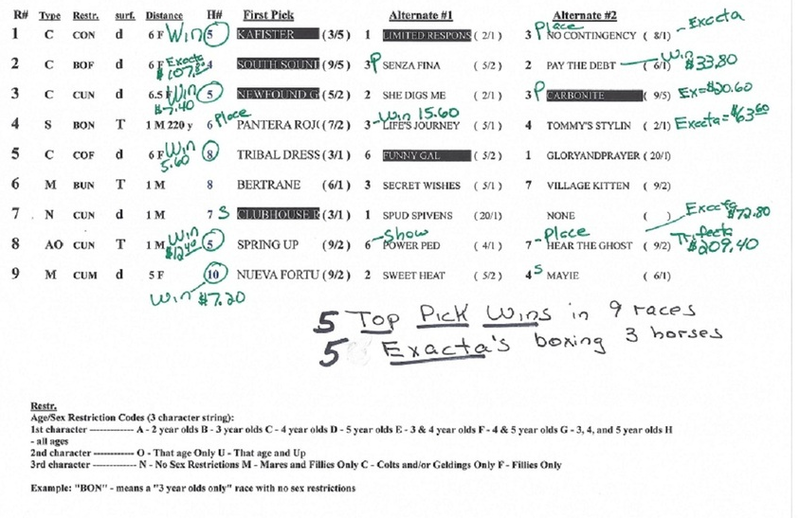 The MC rating is an entire handicapping system my brother Steve and I developed and used back in the late 1980’s, through mid 1990’s. And it is still totally valid today. Back then, we did not have computers. It was a method we did by hand. It utilizes tons of figures and factors. To handicap 1 average race took me 30 MINUTES PER RACE once I was very fast at it! There are many, many factors that go into this rating. I kept track of all the various numbers by using different colored makers. For example, speed may have been in blue, race class red, pace brown, earnings green, positions yellow, etc., etc. When I was done, I had about 10 different colored ratings that I summed up in black. Thus, I jokingly named my method Multi-Colors, or “MC”. But this is how I made a living at the races back then, before computers came along. I played 1 track a day, and it was about 4 to 5 hours per day of handicapping, plus then sitting at the track the rest of the day to wager. But it was a job, and it paid decently. So I stuck with it for many years. Now, thanks to computers and the MIGHTY MC handicapping software, what used to take hours is down to a few seconds! **Mighty MC uses the PP DATA FILES-single file format From BRIS. If you have other programs that use these files, you can use the same one in Mighty MC. That’s right. Once the MIGHTY MC program was done, I decided to add a couple of other very powerful systems into it. In fact, let me just list exactly what you will see for each race using the MIGHT MC software……..
Official horse number in the first column. The name of the horse is the 3rd column. TRAINER…the win % of today’s trainer. MC….This is the main MIGHTY MC rating as explained above. And…. SPACE…. This is based on my SPACE method, which is a combination of SPeed and pACE. It is a complete methodology based on speed and pace, which makes accurate adjustments of the horses final speed, based on the second call of that race. It hits the $3.00 winners just as easily as the $103.00 winners!! Because of its ability to nail those high prices, I use SPACE mainly for finding long shots. Yes, SPACE for some reason nails many very big priced winners. 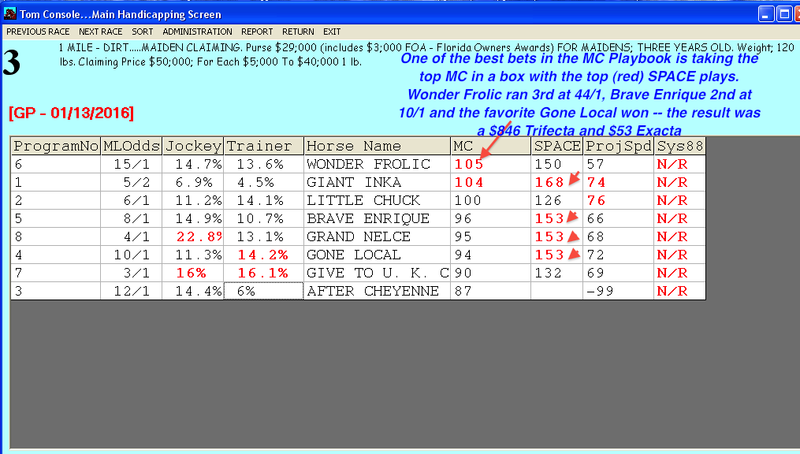 So I look at the top SPACE horse and always bet it when it is 8-1 or up. You will land many $50 and up winners – playing @ 6 tracks per day, I hit @22 $50+ horses per month. Test it at your track and you will see! 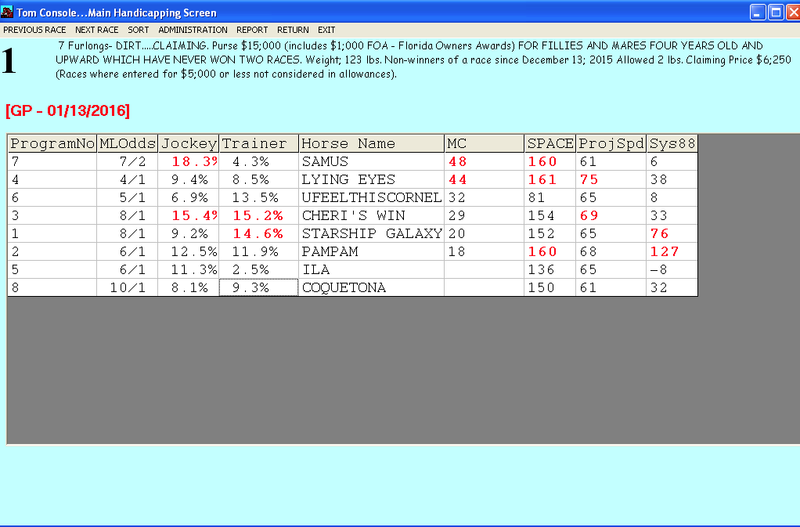 ProjSpd…This is the ‘projected speed’ rating for each horse. This is using multiple races, eliminating certain ones, and averaging the remaining. For consistency, this is a very good rating. Testers of the MIGHTY MC software said that they have developed their own 2 horse betting strategy using just this rating. They just play the top 2 ProjSpd horses in any race where ALL horses have a rating, and the odds make it feasible to make a profit. Sys88…This was a system I developed in 1988…thus Sys88. It is not as complex as MC, but uses oddball factors that when combined creates consistency and an average win mutuel of $10.41. Again, another method that will hit the big payoffs just as easily as the heavy favorites. The method uses factors most of the crowd overlooks at times, thus nailing those bombs. So there you have it. An entire handicapping package, that will take NO WORK on your part, will deliver what once took hours of work to you in just seconds, and will take your handicapping profits to levels you may have never seen before! I know you will be happy with the software. I know you have heard it all before and spent lots of your hard earned money on tons of things in the past. This is why I am trying to make it as affordable as possible, so don’t miss out on the $118 special deal. You will love this program!!!! AND>>>> There’s MORE!!! TAKE a LOOK at the screenshots below!! You Get My Insta-Pick Pr0 Ultimate — FREE!!! Updated for 2016 and ready to run on all Windows versions, including Windows 10.0! This has been one of my most popular programs ever!! · Uses BRIS $1 single file DRF file. NO USER INPUT or DECISIONS! · All races will usually print on one single sheet of paper. · All races instantly handicapped in seconds! · PRIME PLAYS highlighted for you automatically! · Not affected by “late scratches”! Above you see a sample printout of a recent day at Santa Anita. I was visiting relatives in California, and we went to Santa Anita Sunday. Boy, was I a hero! Insta Pick Pro Ultimate does them all! Players that have been using different versions of Insta Pick Pro for years have various styles of play. 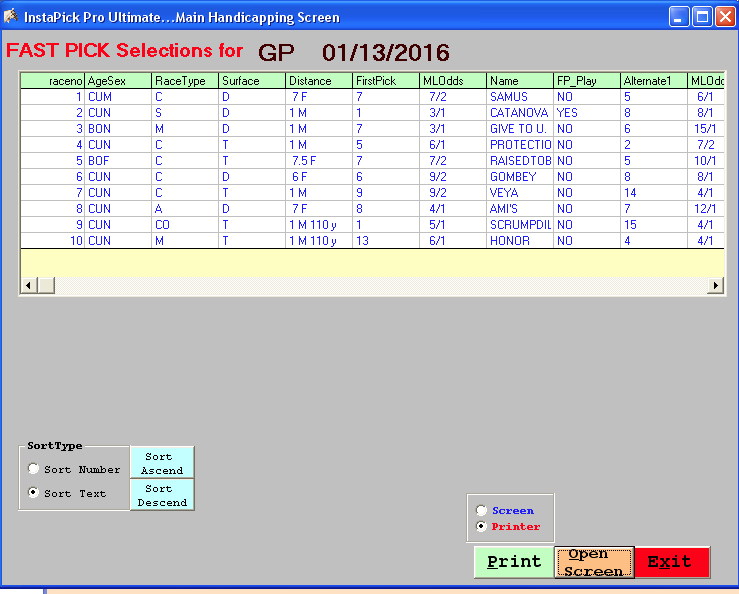 Most use the top pick for win, place or show types. Others look for “High Odds” picks among the 3 listed horses. Some box all 3 in exactas and trifectas. Others have been playing the PRIME plays in show parlays and doing well. In the history of the game, there has NEVER been a program that has been easier to use, and yet remain SO Incredibly EFFECTIVE, especially with the NEW UPDATE! Some days will seem like you have a crystal ball that is just handing you winner after winner! There have been days where Insta Pick Pro has SWEPT THE ENTIRE CARD! $138 retail – yours FREEEE!! So Get Your Package TODAY — The Mighty MC and Instapick Pro Ultimate! Just $118 at the discount price. And, of course, if you are not satisfied, your purchase price will be fully refunded.